Back in the saddle again. Returned Sunday night from a 4 day trip to Philadelphia escorting 62, Florida 8th graders. It was a nice trip, not without its issues but we overcame them and never missed a beat. This was our first foray to the City of Brotherly Love. For the most part we nailed it. A few tweaks for the next one and it will rank as being one of our best! The week prior I was heavily involved in the democratic process here in Palm Beach County. 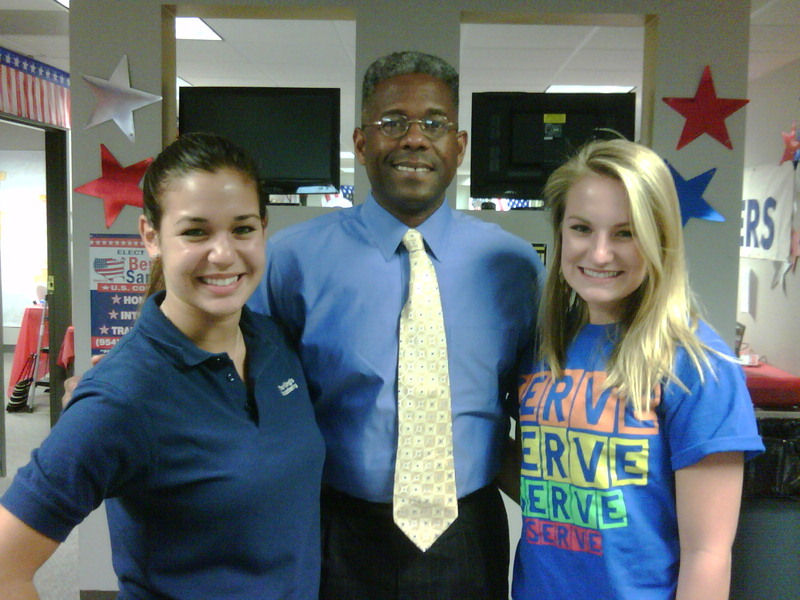 I campaigned (along with my daughter) for our new Congressman Allen West. We volunteered at the headquarters and joined a phone bank calling to get out the vote. LTC(R) West made an appearance; the photo is going to be pretty cool when he becomes our president! My poll watching on election day was successful. I was stationed at a heavily Democratic skewing poll. When I inspected the printed tape of the tally at night’s end the votes ran 4 to 1 for the Dems. The turnout was extremely high too. I was in a retirement complex with about an 80% Jewish population. The average age was over 75. It was walker and wheelchair city! Needless to say the whole day was tedious for everyone. When the electronic tapes and paper ballots were reconciled and safely sealed for shipment to the election supervisor I headed off to Allen West’s victory party at the Marriott in Boca Raton. It was in full force by the time I got there just after 9pm. 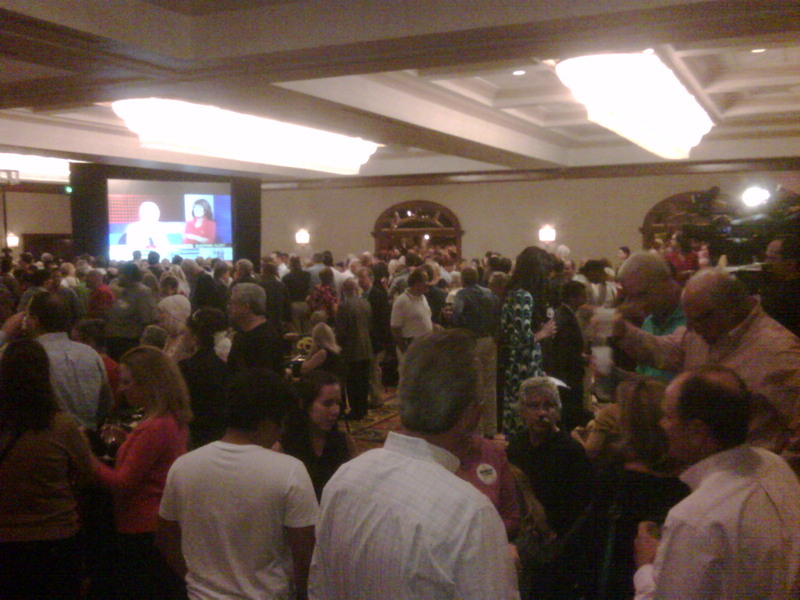 The ballroom was packed with supporters, volunteers, staff and the press all watching the returns come in. Two huge video screens broadcast Fox News’ election night coverage. The energy was incredible. Being surrounded by like minded people all sharing the same passion and vision for our country was unreal. It was just after 11pm when Mr. West made his appearance. He gave a 10 minute stem winder of a speech, not quite accepting victory. Only 43% of the vote was in so far and he had a 10% lead. It was mathematically feasible to lose so his opponent, Ron Klein, hadn’t conceded yet. It wouldn’t be until 12:29am that it would be official. I had since left and was watching Fox News at home when they called it for West. It sure is great to have backed a winner, but even more so because he was the right man for the job and for America. I had never involved myself to this degree before and I am sure hundreds of thousands of other Americans hadn’t either. I’d like to think we were the reason for the conservative landslide. The next two years are no time to rest on our laurels. There is still much to do and so many liberals to oust. Thanks to all my friends who responded with financial support for Allen West and all the conservative candidates.